Week 14 pits the Ravens traveling to Arrowhead to take on the Chiefs in a high-stakes game where there are playoff implications for both teams. The Ravens come into this one currently on their hottest stretch of the season. Baltimore is currently only a half game behind the AFC North-leading Pittsburgh Steelers. Meanwhile, the Chiefs continue to roll, but the AFC West rival Chargers continue to stay on their tail. As we head into the week, the Chargers only trail the Chiefs by a game in the AFC West standings. There are many matchups in this game where something’s got to give. Let’s take a look at some of them heading into Sunday’s Chiefs-Ravens matchup. Earlier in the season when we were heading into the Chiefs’ Week 5 matchup vs the Jaguars, the matchup pit the Chiefs number one offense vs Jacksonville’s number one defense. That’s exactly where we are at again heading into this game. The Chiefs are number one in points per game, while the Ravens are number one in points allowed per game. We saw the Jaguars talk the talk, but they couldn’t walk the walk. Also after the loss to the Chiefs, the Jags went 1-7 in their following portion of the season. That’s where the Ravens are different. Their defense has been respected for a long time, and throughout this entire franchise’s history, defense has been the main staple of this team. So compared to most teams, they can talk the talk and also walk the walk, matching up well with most offenses. But has the Baltimore defense ever faced someone like Patrick Mahomes? Plus, Sammy Watkins is doubtful and newly signed Kelvin Benjamin is unlikely to be ready already, so if Tyreek Hill and Travis Kelce don’t produce, younger guys will have to step up. That’s one matchup that will be entertaining to watch on Sunday. It’s no secret the Chiefs have struggled against the run for most of the season. They currently rank 20th in rushing defense, allowing 122 yards per game. Kansas City also is tied with two other teams for most yards allowed per rushing attempt, at 5.1. They will have to hold on against a perpetual Baltimore running game. During the Ravens three-game winning streak, they have carried the rock 145 times. Which is a staggering 48.3 rushing attempts per game. With that steady feeding of the run game, the Ravens eat up a lot of clock. That means the Chiefs defense must make the stops when needed, and the KC offense needs to reach the end zone consistently. It’s not just dual-threat quarterback Lamar Jackson either. Baltimore allows for four different running backs to get involved in the ground attack, as well (Gus Edwards, Javorius Allen, Kenneth Dixon, Ty Montgomery). The Ravens aren’t afraid to throw in a reverse with a receiver either. We’ll double down here on the matchup to watch, by looking at the trenches for both sides of the ball between both teams. The Chiefs (5th) and the Ravens (7th) offensive lines are both top seven in sacks allowed respectively. On the other hand, both teams’ pass rush are also in the top ten in sacks. The Chiefs are 2nd in sacks believe it or not, and the Ravens are 9th. Both teams quarterbacks can also escape pressure with their legs, beat the blitz by getting the pass out quickly and are able to make insane passing attempts on the run work. If either team’s pass rush can consistently corral the opposing quarterback, then that could provide a big difference in the outcome. The Mahomes stat to know this week – he has more passing touchdowns in 12 games this season (41) than the Ravens do in their last 32 games (39). The Ravens have not allowed a pass catcher to have a 100-yard receiving game this season. Yet, the Chiefs have had 12 individual 100-yard receiving games. Even though the Chiefs and Ravens have split the all-time series at four games apiece, the Ravens have never lost at Arrowhead Stadium. Mahomes and Co. will be looking to right that ship on Sunday. Thank you for reading this Chiefs-Ravens preview. 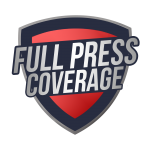 Remember to check out all of the great content offered by Full Press Coverage. Previous articleCoaching Carousel: Who Could Lose Their Seat Next?